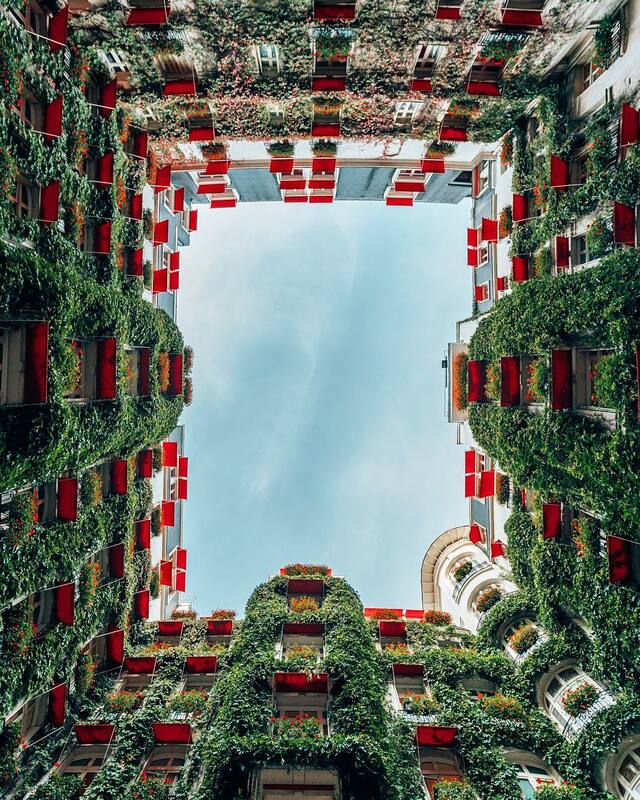 Paris has a lot of visual inspiration to offer for perfect Instagram pictures! As a real lover of beautiful photos, I went for a photo hunt to find the most photogenic locations in the city of love. 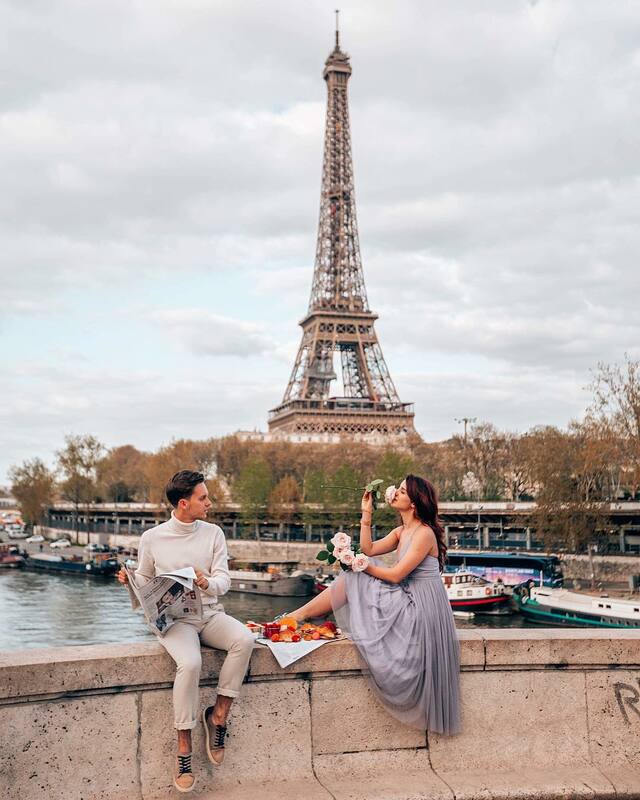 If you are going to visit my beloved city in 2019, then make sure to save and share this article with Top 10 Instagram worthy places to take pictures in Paris. 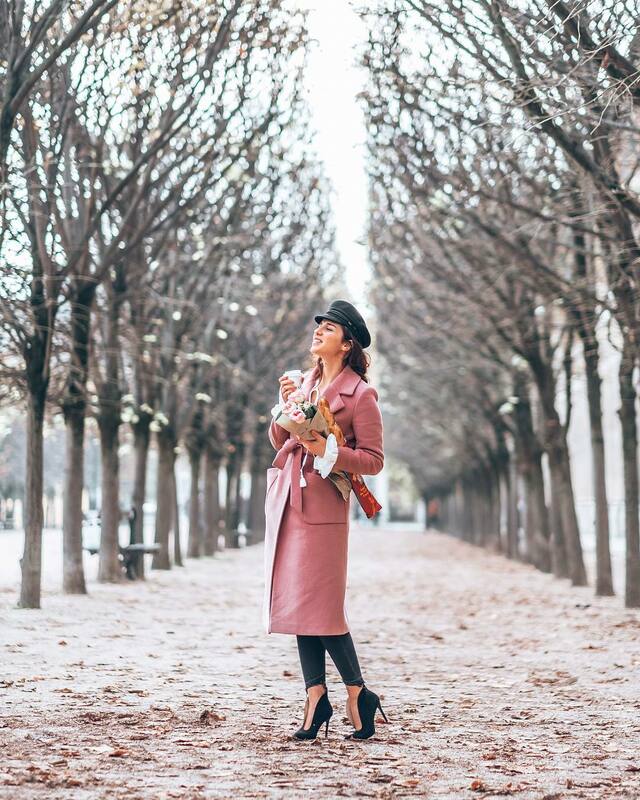 Today I will show you the most “Instagramable” places of the French capital where the photos you take turn a work of art as you can’t do otherwise in a such a beautiful city! I am sure that you have already seen Trocadero views on thousands of Paris photographs and Instagram pictures. It’s definitely one of the most famous tourist locations as it offers an outstanding viewpoint on the Eiffel Tower right in the palm of your hand. Nevertheless, there is a hidden spot just in a 5-minute walking distance from Trocadero with the view that is no less beautiful but without huge crowds in the background. Avenue des Camoens is a quiet street in a residential part of the area with an undeniably stunning look at the Eiffel Tower. For an unknown reason for me, not too many people and Instagrammers take pictures in Jardin du Palais Royal, probably, because it is not such an evident location to find, exposed for everybody to see like the Eiffel Tower or Notre Dame de Paris. Palais Royal is a former royal palace turned into the Constitutional Council now that consists of the palace, its gardens, cafes and shops and numerous arcades opened to the public. The inner courtyard includes striped columns as a piece of modern art by Daniel Buren. 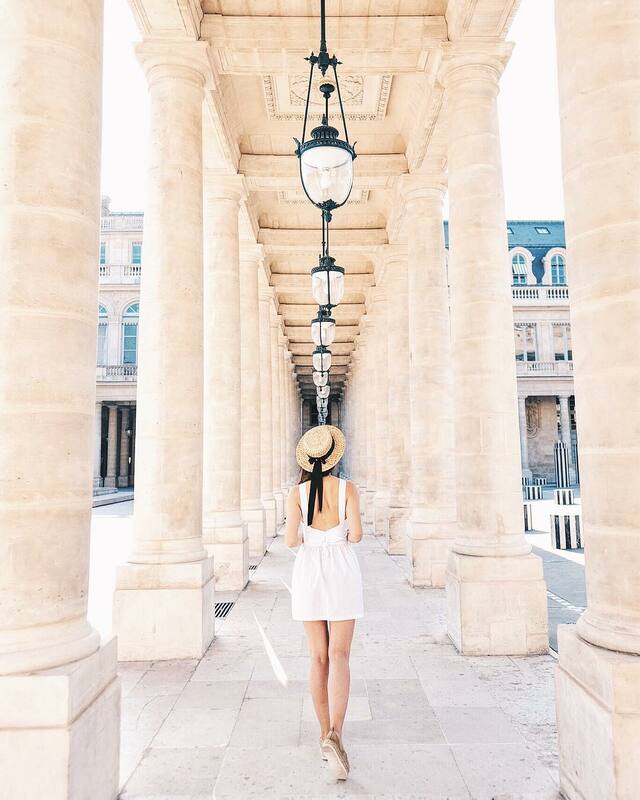 Lush gardens, a mixture of an old and new make Palais Royal one of the best locations for taking an Instagram worthy pic. It is particularly interesting to visit the palace during spring months because you can find cherry and magnolia blossoms here, but also stunning roses and daffodils! See my Cherry Blossom Guide in Paris for more information about blooms and the best locations to photograph in April 2019. 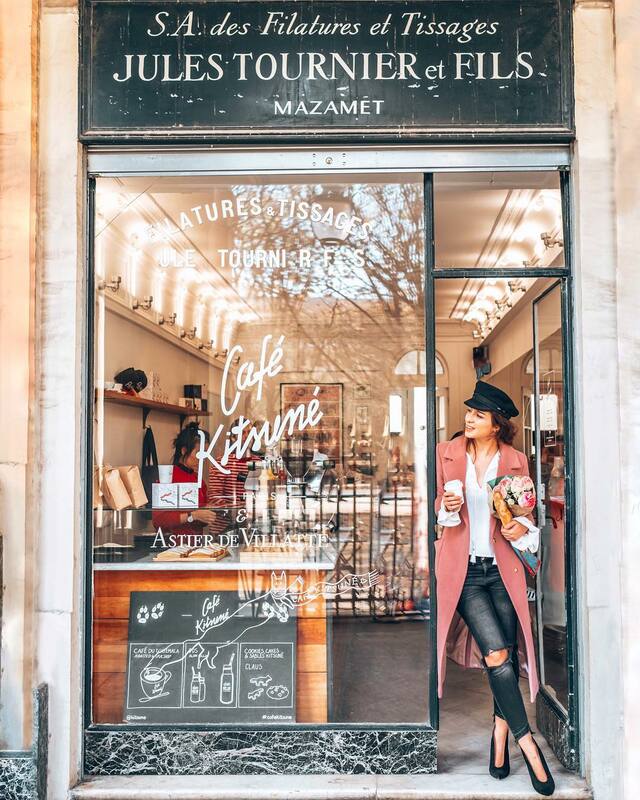 Make sure to enjoy a cup of famous matcha latte in one of our favourite coffee shops Cafe Kitsuné located under one of the arcades. It has a very photogenic facade too! Insider Tip: According to the French law there is a restriction for commercial photography of national landmarks which Palais Royal is part of. For this reason, there are people specifically assigned to surveil visitors, so they aren’t breaking the law in the gardens. Generally, every time we took out our camera these people approached us to question and stop photo shooting. I advise you to not to go crazy with huge gear, tripods and outfit changes that might attract too much attention. Bir Hakeim also sometimes called Inception Bridge is a stunning location for the perfect Gram. The bridge crosses the Seine river and is made out of steel. It divides the street into two levels: one for automobiles and one for pedestrians. The viaduct above is a train line 6 of Parisian metro. The railway viaduct is supported by metal colonnades which creates an amazing perspective for pictures. There is also an enormous choice of angles giving a unique view of the Eiffel Tower that I never get bored shooting there. In Paris, just a usual street can turn into an amazing photo location. I know how finding new angles to take pictures with the Eiffel Tower can be hard. 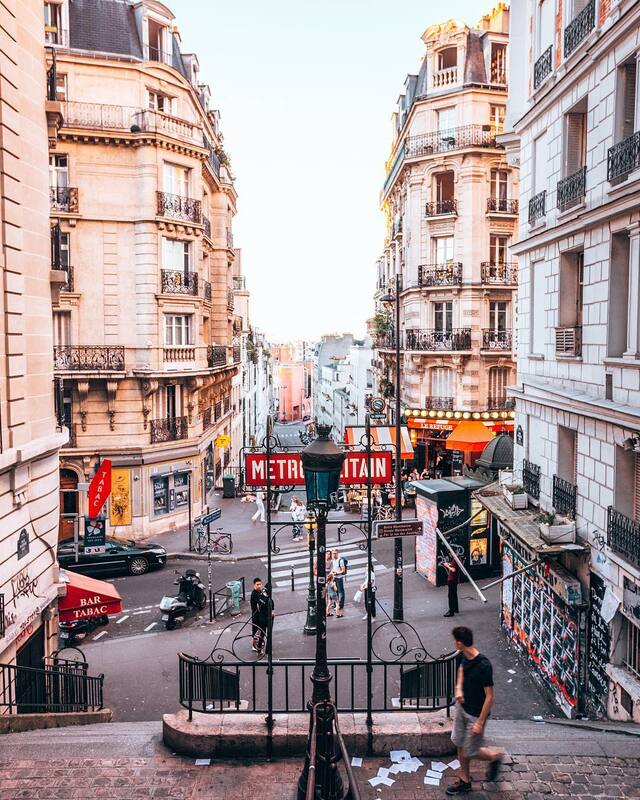 So, when I am tired of classic pictures from Trocadero, I head to Rue de L’Université and to Rue de Monttessuy which aren’t far from each other. You can walk via residential streets, and pass through some nice Haussmanian buildings. The streets and neighbourhood are rather quiet without crowds which is perfect for photo and Instagram shots without any people on the background. However, if you are up for a nice stroll, you can walk all the way up Rue Saint-Dominique till the corner of Boulevard de la Tour-Maubourg to reach Le Recrutement cafe. 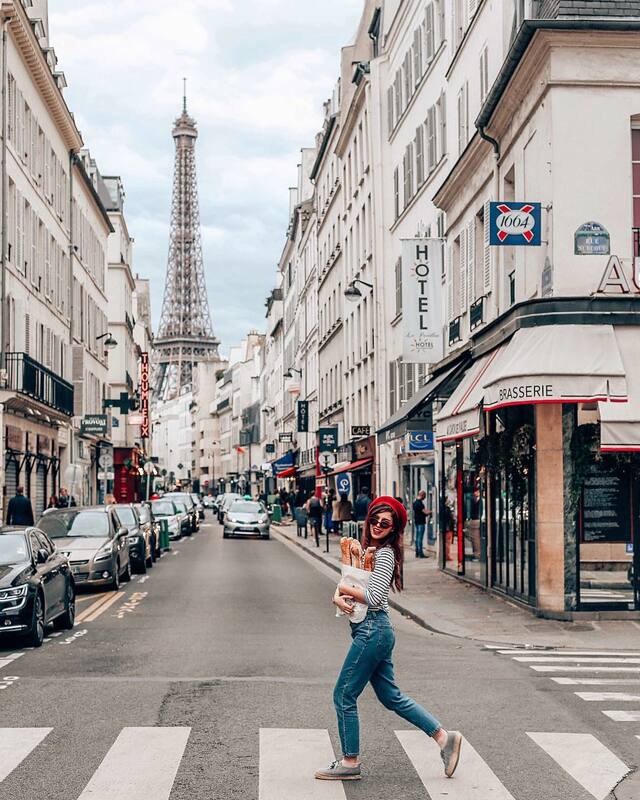 It’s a very unique place to take pictures with the Eiffel Tower street view and a traditional Parisian bistro. The street is lively where the density of small restaurants and shops of various kinds creates a village-like atmosphere in this very nice part of Paris. I love everything about Plaza Athenée from inside out. 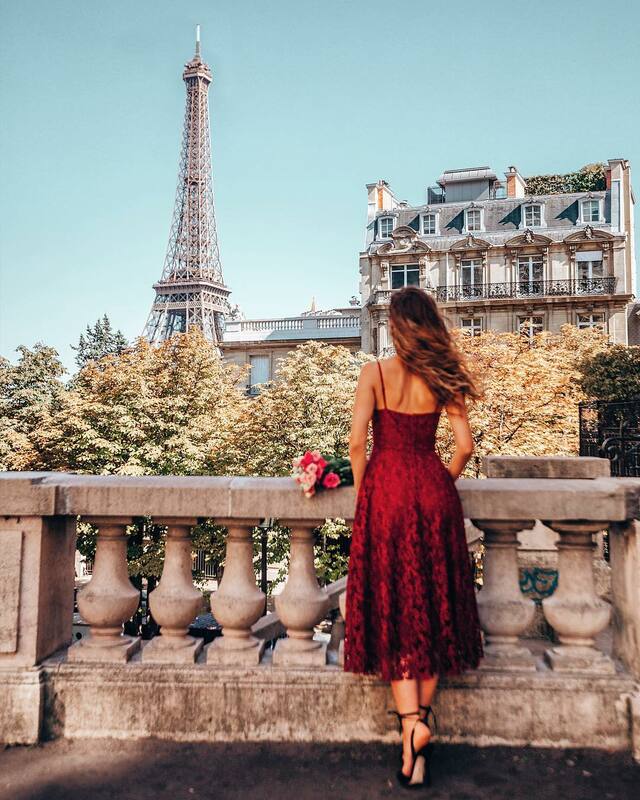 If you want to take a charming Parisian picture for Instagram, you don’t have to rent a luxury suite at the Plaza. 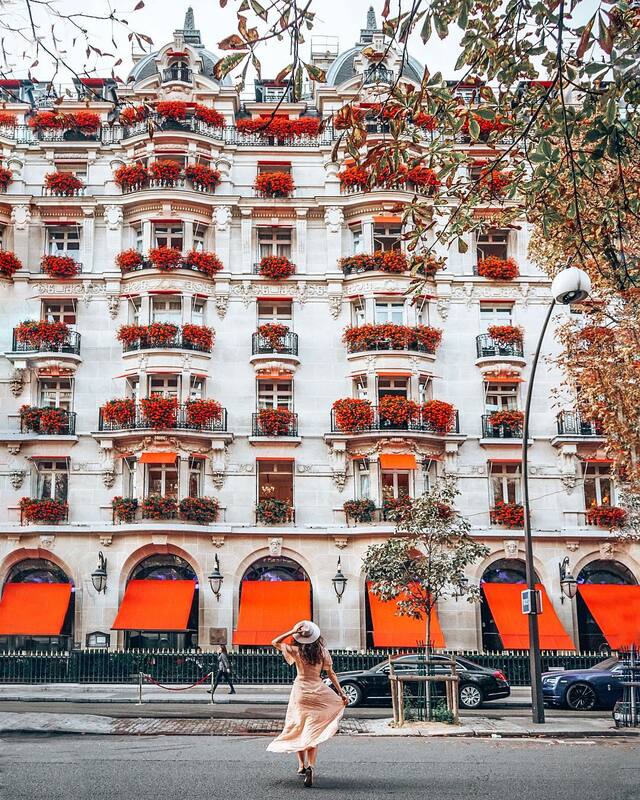 The facade and balconies of the hotel are decorated with flowers which turn the hotel into the dream of red. They practically have become an iconic emblem of Plaza. Another beautiful spot for the Instagram is located at the inside court of the hotel. The walls are surrounded by lush curtains of greenery making it such a beautiful place to be. You can freely go inside to take a picture and even reserve a table under beautiful Parisian sky. Insider Tip: If you are travelling to Paris in winter, the restaurant will be closed but don’t worry, the court is turned into an ice rink! How amazing and unique is that for photos? 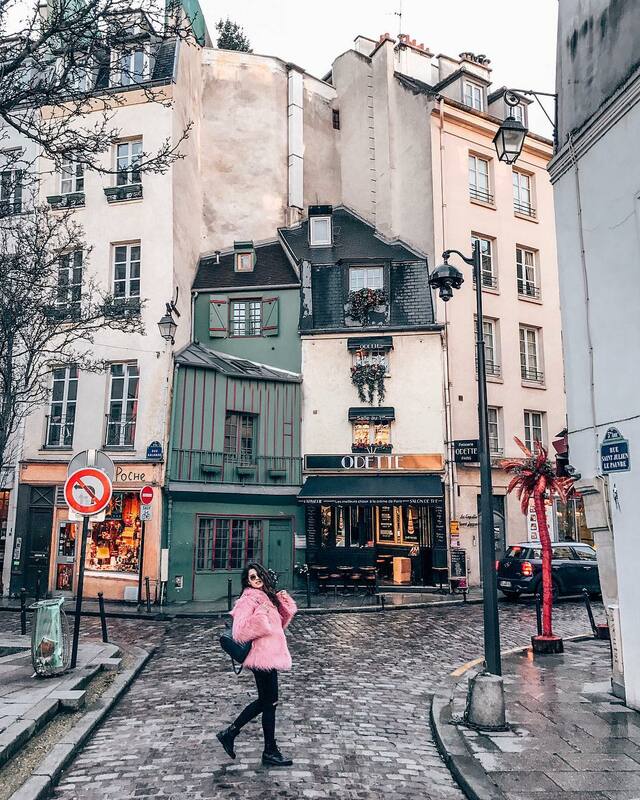 Rue Crémieux is a charming little cobblestone street in the 12th arrondissement. It’s probably the most colorful street with private houses painted with cute mural art. 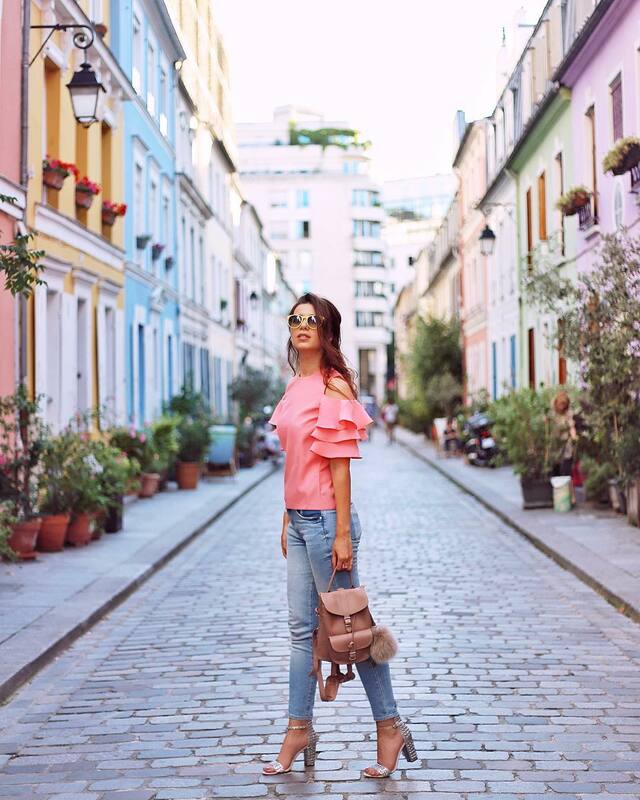 It somehow reminds lovely homes on Burano island in Venice and Notting Hill district in London but Rue Crémieux is a real life blogger paradise as this place is 100% pedestrian, so there are no cars or any other transportation means whatsoever that can ruin the background of your Instagram shot! Lamarck – Caulaincourt is a metro stop of line 12 of the Paris metro, located in the 18th arrondissement of Paris. It was featured in one of my most favourite movies ever – “Le fabuleux destin d’Amelie Poulain”. The station has pops of red colour which matches so well with the restaurant in front making the location perfect for a truly Parisian photo shooting. 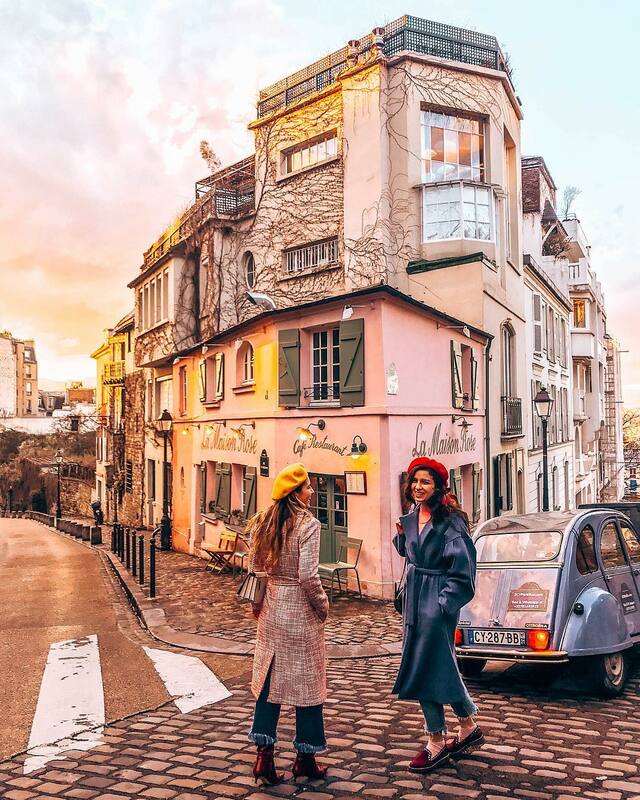 La Maison Rose is undoubtably the most Instagrammable place in Montmartre. For many years, the Rose House has been attracting tourists and Instagram bloggers from all over the world mainly due to a very charming of the facade and pale pink coloured decor. So, better come early to avoid the crowds. 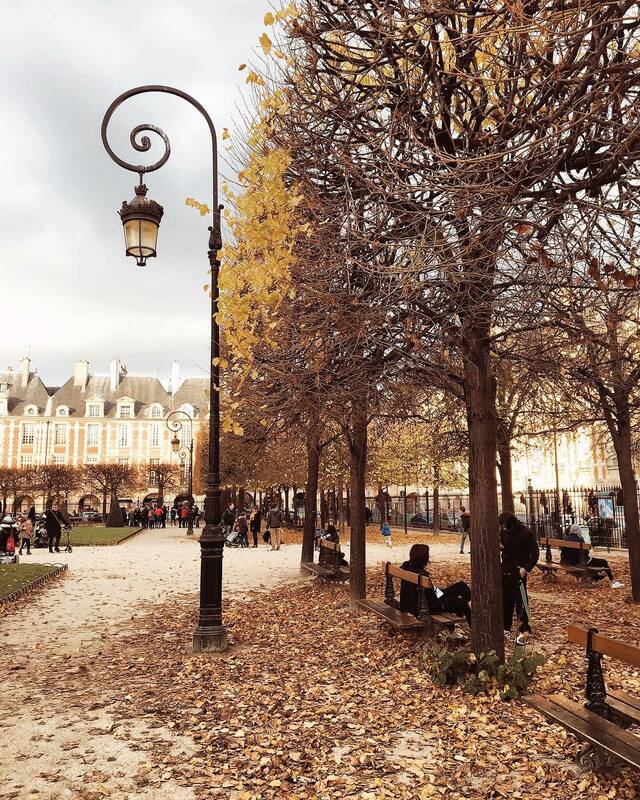 Place des Vosges is the oldest square in Paris located in the heart of Le Marais district. The square is filled with cute little corners, old cars, outside terraces and it is very picturesque during autumn months when the park turns into a golden forest! In addition to that, if you love the works of Victor Hugo, then you shouldn’t miss Victor Hugo’s Maison situated at Place des Vosges. There you can learn more about the life and work of the writer but also enjoy a stunning view of the park from the windows of the museum. Click here to read more about Forgotten Museums of Paris in this article! 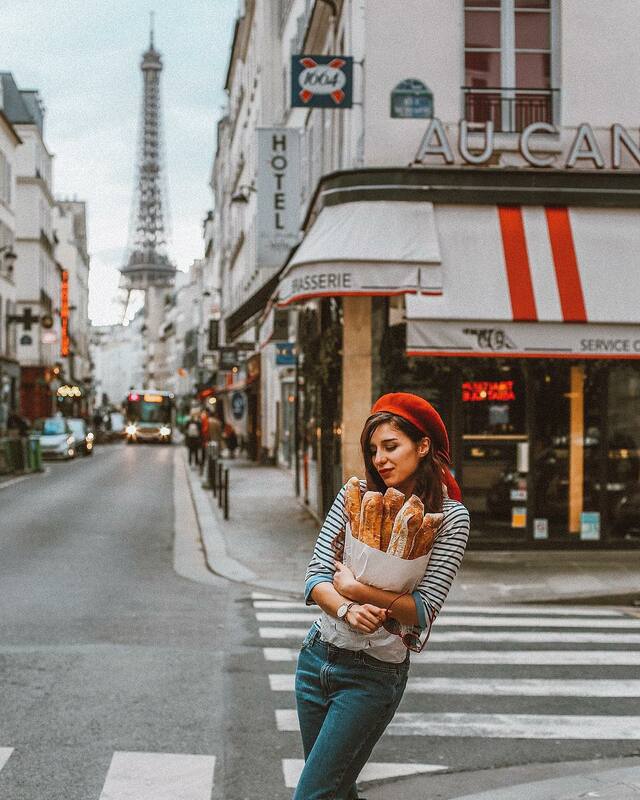 One of the most beautiful things about Paris are facades and pastry shops, in other words, “boulangerie”! 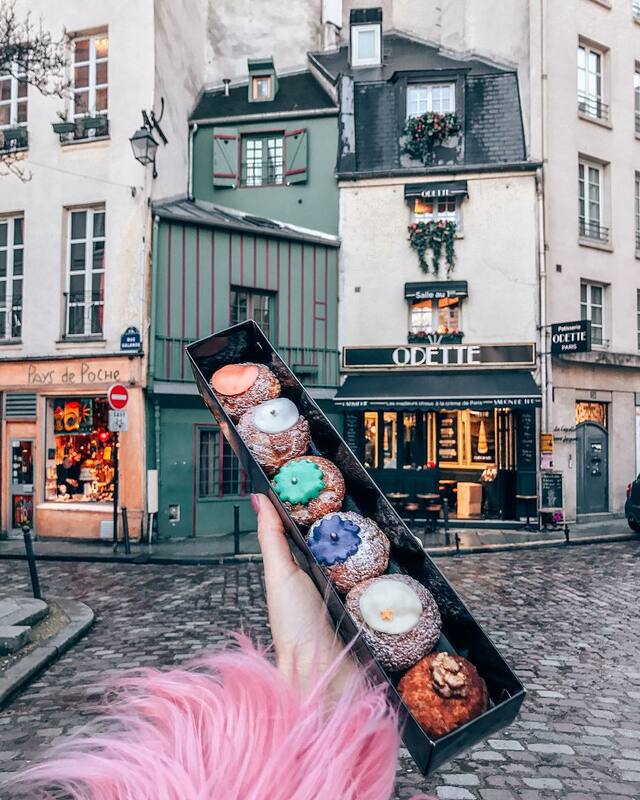 A charming bakery Odette is located near Notre Dame de Paris and serves cute cream puffs called “choux à la crème”. Looking at Odette’s facade hugged by old Parisian houses always makes me feel very cozy! Insider Tip: If you follow the stairs to the second floor up, you’ll find a “salon de thé” in the Art Deco style, where you will have a unique view of Notre Dame. It’s the perfect little place to feel fancy and Parisian. 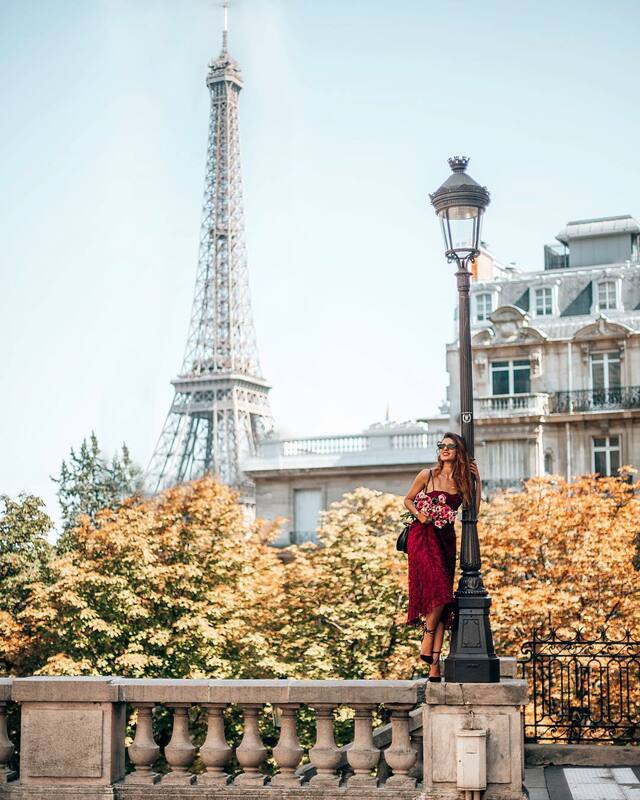 These are some random top 10 Instagram picture spots that I love and shoot the most in Paris but the French capital is beautiful and photogenic in literally every corner! I tried to sum up my favourite ones in one list. I plan to share more photo tips in Paris in the future. Would you like me to talk about some evident “must go” photo locations in Paris or do you prefer me to reveal more hidden gems? Let me know in comments below! Thank you, babe! You should come back soon! It’s amazing post thank you so much ❤️ In April, I’m going to have a holiday in Paris, and I was searching about some spots for Instagram, then you post your blog about this topic 💃🏼 Thank you again! April is my favourite time ever! Read April blossom guide for some photo spots inspo! I’m going to Paris next year and have been wanting a nice list of great places to take a picture at. Thanks a lot! I’m super excited to visit! Thank you so much for the post! Love it and will definitely hunt these down when I visit Paris!